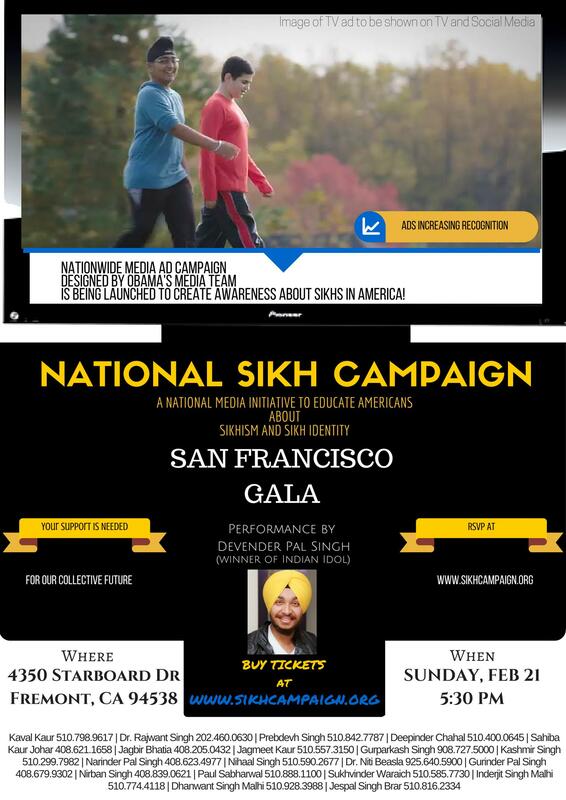 Please join us on February 21st at 4350 Starboard Drive in Fremont for National Sikh Campaign's first gala of the year. There will be entertainment by Devenderpal from Indian Idol fame and we will review National Sikh Campaign's goals for 2016 and accomplishments from 2015. RSVP by making a contribution to the campaign. Your digital receipt will be used as a ticket. Note that all donations are tax deductible (tax id #: 52-2346001) and proceeds will go towards the National Sikh Campaign. Contributions of $1,100 or more BEFORE or AT the gala are greatly appreciated. If you are unable to RSVP, you can still contribute by making a donation at this link. The National Sikh Campaign (NSC) is a national media campaign to educate Americans about Sikhism and Sikh Identity. We all know most Americans don’t know about Sikhs and due to this ignorance, our community has faced violence, bullying and prejudice. NSC has engaged President Obama’s former media team to prepare compelling and informative ads on Sikh-Americans that can run on national & local television and online. The campaign will be executed using sophisticated techniques and each step is being tested with focus groups and thorough polling for effectiveness. This is the first time our community is taking a giant and methodical step to reach out to our fellow Americans. It requires financial support of all Gurdwaras, Sikh organizations, Sikh businesses and each individual Sikh. To learn more about the event please checkout a short message from the organizers: Kaval Kaur and Dr. Rajwant Singh below.